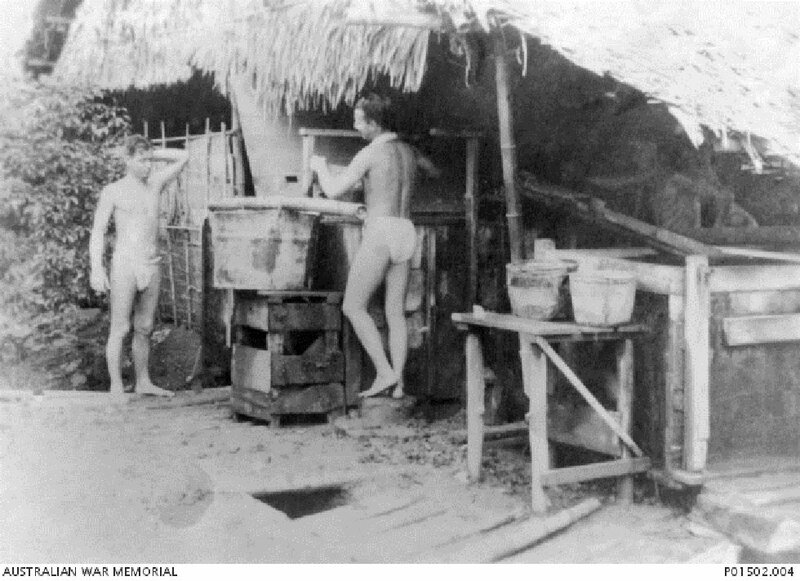 Two loincloth-clad POWs draw water to prepare their daily rice stew, beside the attap cookhouse hut in Kanburi POW Camp, 1944. Image courtesy of John Munslow Williams, Australian War Memorial. The defendants, who originated from Formosa (present-day Taiwan), were civilian employees of the Taiwan Takushoku Kabushiki Kaisha, a company which engaged in profitable undertakings for the Japanese war effort. The defendants were working as farmhands for the company. The defendants were charged with committing a war crime in that they ill-treated and caused the deaths of Khan Samir and Khan Mohd, two civilian residents from Port Blair. The victims, who were coolies working under the supervision of the defendants, were accused of stealing rice from a fellow coolie. The defendants had allegedly tied the victims to a cross-beam and beat them up with a stick for at least five hours, thereby causing their deaths. The Japanese defence counsel appeared to be unfamiliar with the general court procedures, and was frequently reminded against asking leading questions during examination-in-chief and questioning the defendants about the affidavits made by other witnesses. This could be attributed to counsel’s training in an inquisitorial system. This possibly led to the court giving limited leeway in favour of the defence counsel to prevent him from suffering any disadvantage. The prosecution also appeared rather hostile towards the defence counsel, and seemed overly aggressive and at times sarcastic. This possibly led to the prosecution being “told off” by the judge. 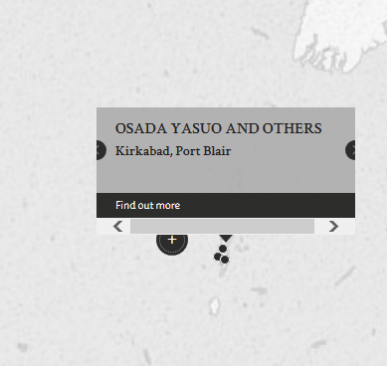 Osada, Yasue [Tiong, An Soon]. Civilian. From Formosa (present-day Taiwan). Guilty. 4 years' imprisonment. Sentence confirmed. Sugimoto, Akio [Wong, Chong Hoe]. Civilian. From Formosa (present-day Taiwan). Guilty. 3 years' imprisonment. Sentence confirmed. Nagata, Masa Aki [Tu Swee Chiau]. Civilian. From Formosa (present-day Taiwan). Guilty. 4 years' imprisonment. Sentence confirmed. Le Gallais, R. L. Lieutenant Colonel. From British military. Court president. Barrister-at-law. Marseille, R. K. G. Captain. From British military. Bains, N. S. Captain. From British Indian Army. Khan, A.M. Md. Captain. From British Indian Army. BA LLB. Takahashi, Mikio. Judge of the Tokyo Civil Court, Japan. Evans, T. Captain. From British military.